Why is Internet marketing so complicated? The Internet was not built to enable people to sells goods. The Internet was built for Scientists and Engineers to share information. It was built to still work even as the late 1970s equipment that connected computers failed1. In a simplified view of the Internet, every time you connect to a part of the Internet, your local part of the Internet calculates the best path to that part of the Internet. When you look at this map of one small part of the Internet you can see that you get from one part of the Internet to another through a number of different sized pipes. 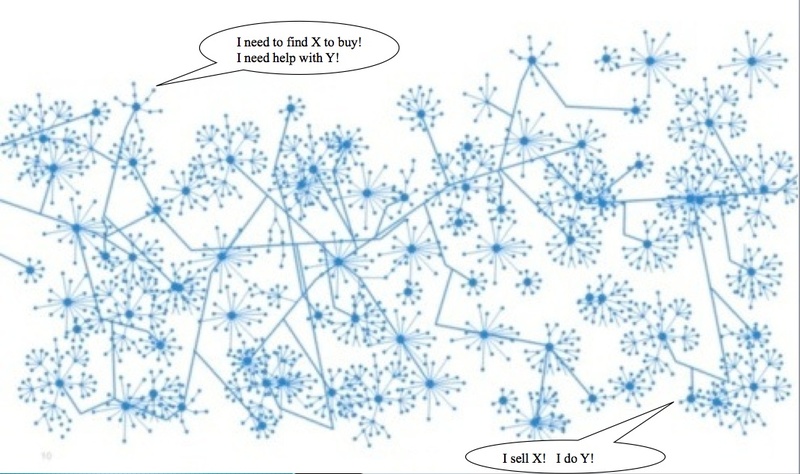 So the challenge of the Internet is how does a people who wants to buy X or get help with Y find someone who sells X or does Y? You need to find the methods that enable your customers to find you. You need to create information that earns people’s interest in your products and services. It’s not something that you can buy. There are many methods that can be used to reach customers such as blogs, Facebook, Twitter, Linkedin and Optimized WebSites. You need to find the right mix of tools to reach your potential clients. The approach is different for every business. 1. Read more about the history of the internet click here.